Combine the water and spinach in a blender and blend until smooth. (You may need to add a little more water to help the process). This should make 60ml of liquid at the bottom of the blender, if not, add a little water to make it equate 60ml. Mix the flour and salt together in a bowl. Make a well in the middle and add in half of the hot water and all of the spinach liquid. Mix until a crumble forms, then add the rest of the water. Combine together until a rough dough forms and the dough can hold its shape. Transfer to a lightly floured work surface and knead dough for about 2-3 mins until it is smooth. Divide the dough into 4 equal parts, then wrap in glad wrap, let it rest for 1-2 hours at room temperature. Whilst dough is resting, you can make the vegetable mixture. In a bowl combine: cabbage, carrot, shiitake mushrooms, white pepper, soy and sesame oil, mix well and set aside. Once rested, roll the dough into a log shape, about 2.5cm width, then cut into 1.5cm pieces. Roll each disc into 8cm round circles. Fill each gyoza wrapper with the vegetable mixture, being careful not to fill it too much. Seal the wrapper with water and press firmly. Heat some vegetable oil in a pan to a medium heat, arrange gyoza in pan, then quickly add water and put on the lid to allow the gyoza to steam. Cook for 6-8 mins, remove from pan. Place the flour in a bowl, making a well in the centre and gradually at the water whilst whisking. Combine until smooth. Cover with glad wrap and place in the fridge for 30 mins. Once rested, add the egg to the batter whilst whisking, then add the cabbage and the spring onion and mix well. In a fry pan, heat 2 tbsp of oil, then place the mixture into the pan, creating 3 or 4 medium sized okonomiyaki to suit the size of your burger. Cook for 3 mins, then flip and cook for another 2 mins. Remove from pan and decorate with kewpie mayonnaise and hoisin sauce. Using a large circular cutter, cut a disc of firm tofu about 1cm thick. In a fry pan, heat vegetable oil to a medium heat and lightly cook the tofu about 2 mins each side, remove. Place sugar, soy and sesame oil in the pan and heat to medium heat. The mixture should start to thicken as the sugar caramelises. Once it starts to thicken, place the top of the burger bun into the pan for the caramelisation. Cook for 1 minute, then remove from pan. 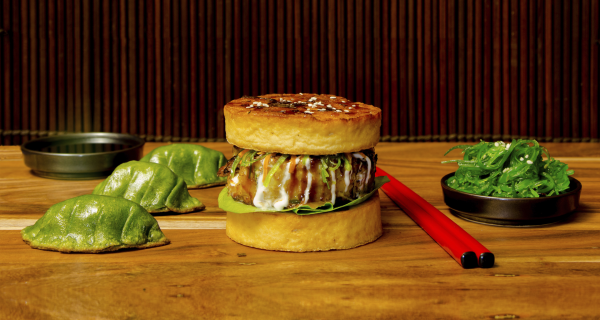 To construct the burger, place the burger bun onto a plate, the place lettuce, okonomiyaki, complete with the sauce, carrot, seaweed and the burger top. Sprinkle with sesame seeds and finely chopped nori.